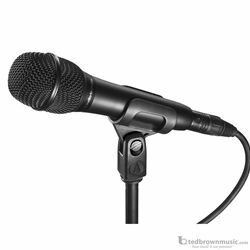 The AT2010 is designed to bring the studio-quality articulation and intelligibility of Audio-Technica's renowned 20 Series to the stage, for crystal-clear vocal performances. Featuring the same 16 mm low-mass diaphragm found in the critically acclaimed AT2020 side-address studio condenser, the AT2010 excels wherever articulate vocals are needed: in houses of worship, for solo performances, jazz vocalists, singer/songwriters, and more. Extended frequency response and superior transient response for smooth, natural sonic characteristics. High SPL-handling and wide dynamic range provide unmatched versatility. Multi-stage grille design offers excellent protection against plosives and sibilance without compromising high-frequency clarity. Corrosion-resistant contacts from gold-plated XLRM-type connector. Rugged, all-metal and construction for years of trouble-free service. Quiet-Flex™ stand clamp provides silent, flexible microphone positioning.